Goffin Cockatoo's are native to the Tenimber islands of Indonesia. 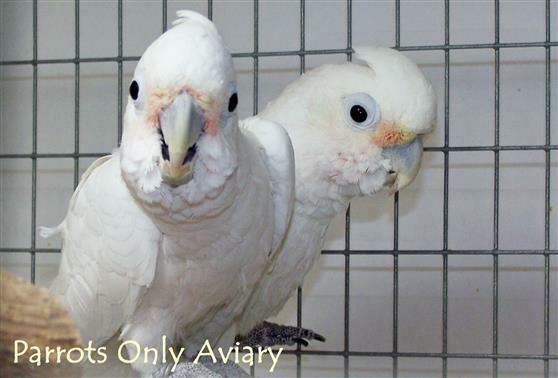 Goffin's Cockatoos are a smaller cockatoo that is white with pink highlights in front of the eyes and on the breast. Goffins are one of the better talkers among the cockatoos. They can be taught all kinds of tricks. Size: 32cm (12.5 in) Weight: 300g (10.5 oz) . The Goffin Cockatoo is a very active and playful bird. Because of their playfulness they need many toys to stimulate them. They enjoy time out of the cage and can be quite cuddly. Approximately 35-40 years, depending on nutrition and care.